What are the most popular online bachelor's degrees offered in Pennsylvania? Pennsylvania's State System of Higher Education consists of 14 state universities, each of which offers online academic programs and individual courses. The Bureau of Postsecondary & Adult Education grants permission to private out-of-state degree-granting institutions seeking to offer distance education programs to Pennsylvania residents. In order to ensure the quality of these online programs, Pennsylvania requires that these institutions be fully accredited by the Council on Higher Education Accreditation (CHEA). Students looking for more information can consult PA Universities Online, an online resource provided by the State System of Higher Education. Students can use this site research and find information about online programs. Another helpful resource is the Pennsylvania Distance Learning Association (PADLA). PADLA is a non-profit organization devoted to providing information and knowledge about distance education and encompasses all types of online learning, including continuing education, workplace training, and adult education courses. Online colleges in Pennsylvania offer generous scheduling policies for students with other major time commitments. Most of the state's online programs do not have hard deadlines, meaning students with full-time jobs can watch lectures and complete readings during the evening or weekend when they are less busy. Online colleges in Pennsylvania typically offer significantly lower tuition rates to students studying in their home state. Many schools also offer hybrid programs, which combine online learning with on-campus requirements. Clarks Summit University offers several online programs designed for those with numerous professional and personal obligations, as well as those hoping to complete their degrees as efficiently as possible. The school offers an associate and bachelor's degree in integrated studies, along with bachelor's degrees in Christian ministries and counseling. As a Christian institution, instructors design curriculum from a biblical perspective. A one-year ministry certificate provides students with the foundation needed to serve others in a church or social services setting. The university also offers affordable tuition, with residents and non-residents paying the same rate for all online classes. The school boasts a friendly transfer policy, with the university accepting credits from most accredited colleges and universities. The quality of its programs and faculty make Clarks Summit one of the top online schools in Pennsylvania. Its main campus lies in South Abington Township, a community in the northeastern part of the state. Villanova is a Roman Catholic institution in the greater Philadelphia area known for providing the highest quality liberal arts education, while holding to the Augustinian ideals. To forward these principles, Villanova encourages students to engage in a commitment to service, solidarity, and activism through service break trips, local youth tutoring programs, and at the Campus Ministry Center for Service and Social Justice. Villanova offers a variety of academic programs, including several advanced degree and certificate programs, and bachelor's programs completely online. For students seeking an undergraduate education at one of the best online colleges in Pennsylvania, Villanova's College of Professional Studies offers three online degrees, including the bachelor of arts (BA) in leadership studies, bachelor of interdisciplinary studies in general studies -- ideal for nontraditional, degree-completion students -- and the BA in public service and administration, a perfect option for degree-seeking working professionals. Pitt Online offers students access to a range of high-quality online degree programs. These include two doctoral degrees, nine master's degrees, and a bachelor's degree -- all available completely online. This wide array of distance education offerings makes the University of Pittsburgh one of the most sought-after online schools in Pennsylvania. Enrolled students benefit from a full suite of services, including technical assistance, a comprehensive digital library, the University Writing Center, academic advising, and help with financial aid. Most of its programs charge the same tuition for in-state and out-of-state students, making it highly accessible to those who live across the country. Some of Pitt Online's classes count as massive open online courses, commonly known as MOOCs. Students take these classes free of charge on the internet. Subjects include nuclear science, clinical terminology, disaster preparedness, and gender and sexuality, among others. SRU opened in 1889 as Slippery Rock State Normal School on a bucolic 660-acre campus north of Pittsburgh, Pennsylvania. Its founders established one goal: to train teachers. Since then, SRU has grown into a four-year, public, comprehensive university serving more than 8,500 students with a variety of on-campus and online academic programs -- from accounting to park and resource management -- making it one of the best online colleges in Pennsylvania. For students that want to complete a bachelor's degree online, SRU offers two lauded programs: the bachelor of science in business administration (BSBA) degree, and the bachelor of science in nursing degree (BSN). Beyond these programs, SRU also has a degree program ideal for students that have already completed 60 or more credits, the BS in interdisciplinary programs major, where students work closely with a faculty advisor to design their perfect educational track. A diverse and inclusive academic institution with 17 schools and colleges, Temple University provides the highest quality academic programs and facilities for cutting edge research to more than 38,000 students. Founded in 1888, Temple has a strong history of creating an engaging and immersive academic experience. Today, this happens at one of Temple's nine campuses, and via distance learning, where students can earn both undergraduate and graduate degrees. Temple offers online, distance, and blended courses to give students increased flexibility over their educational trajectories. To ensure online learning operates as smoothly as possible, Temple employs Blackboard -- a web-based learning management system -- and WebEx -- a live conferencing technology -- giving students complete access to web-based collaborative learning environments to facilitate highly-integrated and engaging academics. For students seeking a bachelor's degree, Temple ranks highly among Pennsylvania online colleges, and offers a lauded bachelor’s in business administration (BBA) degree, perfect for students that want engaging, synchronous (real-time) courses. Located in Philadelphia, Pennsylvania, Drexel University is a private research institution consistently ranked among the top in the nation, and currently serves over 26,000 students. A standout among online colleges in Pennsylvania, Drexel offers distance learners and nontraditional students accredited online bachelor’s degrees designed for flexibility, which are recognized for providing the same engaging experience received by on-campus students. The University currently offers 10 online bachelor's degrees in business, communications, criminal justice, education, general studies, nursing & health professions, psychology, and technology. As Drexel has been providing online education since 1996, the University is committed to providing unparalleled experiential learning, quality academics, and support to online students. To ensure students make the right choice, Drexel offers an Online Test Drive, where students experience online learning first-hand and have the opportunity to participate in class discussion, submit a sample assignment, and learn how to use campus resources, like the digital library. Focusing solely on the field of healthcare, PA College of Health Sciences works closely with Lancaster General Health to provide a rigorous education to a select group of 1,400 students. Offering bachelor's, master’s, and several certificate programs, students are provided the option of studying at the newly-established, 24.7-acre Lancaster, Pennsylvania campus, or pursuing degree programs online. PA College offers three bachelor's degrees in an online format, including the bachelor of science (BS) in health sciences, a BS in healthcare administration, and the bachelor of science in nursing (RN-BSN), making it one of the best online colleges in Pennsylvania for those pursuing a healthcare degree. To provide the highest quality online education experience, PA College uses Blackboard Learn to deliver classes, which allows students access to course materials, multimedia resources, activities, and assignments, all within a collaborative, web-based learning space. For goal-oriented students, the online bachelor's degree programs at PA College are an excellent choice. Penn State has been delivering empowering distance education programs for more than 125 years, beginning with the university's first correspondence course, established in 1892. With such a rich history in educating nontraditional students, Penn State became one of the first major accredited universities to provide online education, and in 1998, established Penn State World Campus -- providing rigorous, asynchronous, degree-granting programs online to learners worldwide. Offering more than 30 bachelor's degree programs online -- from accounting and business to political science and nursing -- Penn State is one of the best online colleges in Pennsylvania. The university offers students in 50 states (and more than 60 countries) courses delivered by the same esteemed on-campus faculty, and provides access to a plethora of student services, including academic advising, career counseling, and a research library. Best of all, graduated students receive the same diploma as on-campus students. Emerging as one of the top online colleges in Pennsylvania, LBC offers a variety of accelerated distance learning programs that allow students to complete their degrees efficiently. The school offers fully online bachelor's degrees in biblical studies, business administration, criminal justice, general studies, and human services. The school also makes an associate degree in biblical studies available to students. Classes run six to seven weeks, a change from the typical 15-week terms found at most colleges. Prospective students need a high school diploma or GED with a minimum GPA of 2.0. Their beliefs must also line up with the college's statement of faith, and their life should demonstrate commitment to Christian principles. Located in Lancaster, Pennsylvania, the school caters to students hoping to combine professional advancement with Christian teaching. Duquesne offers online undergraduate and graduate degrees in nursing, liberal arts, education, and business. Combined online/on-campus programs in education and music are also available, as well as accelerated, business-centered undergraduate degrees and a RN-BSN bridge program. Distance students enjoy access to online technical help, academic resources, and a student support network, and can contact faculty through email, online discussion, performance feedback, and interactive technologies. While many programs are available entirely online, some may require an on-site orientation. At Saint Joseph’s, a higher learning institution committed to the Jesuit, Catholic tradition, students receive a well-rounded education focused on personal growth and development, reflecting the Ignatian credo of cura personalis. For students pursuing a degree online, the school provides a range of supportive services, including a network of counselors, advisors and professors, as well as technical support, making it a standout among Pennsylvania online colleges. Saint Joseph's offers master's degree and certificate programs, as well as one online bachelor's degree. The BS in professional and liberal studies is suited for students looking to complete a partially-finished bachelor's degree and excel in the workforce, as this program helps students develop diverse skills that prove useful in any professional environment. The program includes courses perfect for professional development, including using Microsoft Office and organizational writing, as well as courses providing academic foundations for ongoing learning, such as comparative religions and chemistry for the consumer. Offering three online undergraduate degrees and five master's degrees, Millersville University has built its reputation as one of the best online schools in Pennsylvania. The university uses the digital learning management platform D2L Brightspace, and instructors deliver all coursework asynchronously. This means students that can attend lectures, participate in discussions, and complete assignments largely on their own schedules. For consideration, applicants need a high school diploma with at least a B average, along with an ACT or SAT score above the national average. Transfer students need a GPA of at least a 2.0 in all previously completed college-level coursework, entering the school with at least 12 credits. The university is located in Millersville, a small-town community between the state capital of Harrisburg and Philadelphia. Misericordia University is a Catholic university located in northeast Pennsylvania, which excels in helping students succeed. To this end, classes are small (with a 12 to one student-to-faculty ratio), and students may participate in a Guaranteed Placement Program (GPP), which guarantees students will have a job or be enrolled in graduate school within six months of graduation. In addition -- for nontraditional students -- the university offers assistance with services like credit transfer and financial aid, and even offers students the option of earning academic credit for life experiences. Idea for self-motivated students, and those with prior college credits, Misericordia offers two options for online learning. Web-enhanced courses combine in-person and virtual participation, while predominantly online courses offer a virtual approach where students can attend classes at any time in either seven or fifteen week formats. Currently, Misericordia offers nine online bachelor's degree programs, allowing students the power of choice when considering online colleges in Pennsylvania. Students of all faiths will find an excellent education at Saint Francis -- the oldest Catholic university in the country dedicated to Franciscan values. Located in Loretto, Pennsylvania, Saint Francis provides an inclusive community of learners, more than 50 academic programs, and numerous community service, internship, mentorship, and research opportunities. For nontraditional students and distance learners, Saint Francis is one of the most accessible online colleges in Pennsylvania, and provides access to the highest quality e-learning tools to students enrolled in online master's, bachelor's, and certificate programs such as the valuable online Autism Spectrum Disorder Endorsement for professional educators. For students seeking an undergraduate degree online, Saint Francis also offers two bachelor's degree programs in an online format, including a BS in behavioral science, and a BS in health studies, both complete, 128-credit degree programs. Located in central Pennsylvania, Elizabethtown College’s School of Continuing and Professional Studies offers a variety of online programs and classes that enable students to complete their degree in a convenient way. The college boasts one master's degree and two graduate certificates, as well as five bachelor's degrees. Students complete each of these programs entirely online. Prospective students need to be at least 23 years old to be admitted. They also need a high school diploma or GED and must demonstrate sufficient writing abilities. Admissions requires at least three years of full-time work experience for admittance. In addition to Elizabethtown, the college has campus locations in Harrisburg, Lancaster, and York. It is quickly becoming known as one of the top online colleges in Pennsylvania. At Peirce College, faculty, staff, and administrators are committed to fostering strong relationships with students, and maximizing student success. To that end, and to ensure earning a degree is not complicated, Peirce offers online bachelor's degrees in several fields, including business, healthcare, information technology, and legal studies. Online courses can be accessed at any time, from anywhere with an internet connection -- this includes course lectures, class materials, coursework, and online threaded discussions. In addition, the college offers all on-campus support services to online learners, meaning advising, tutoring, and academic workshops are all available online -- a standout among Pennsylvania online colleges. As an added benefit to students taking online courses, Peirce provides all students the freedom to switch back and forth, at any time in the semester, between a traditional classroom experience on the Center City, Philadelphia campus, and online learning. Called Peirce Fit, this flexible approach to learning makes getting a degree as convenient as possible for students. Located in Allentown, in Lehigh County, Pennsylvania, Cedar Crest College has been breaking boundaries since its founding in 1867, when it established a higher education curriculum tailored to women. To this day, the College continues to forward its longstanding commitment to ensuring women succeed in the global community. Understanding that students have diverse needs, the College offers many opportunities for nontraditional students, delivered through the co-educational School of Adult and Graduate Education (SAGE), via online learning, and with blended courses that combine traditional, on-campus education with web based learning opportunities. For distance learners looking at online colleges in Pennsylvania, Cedar Crest offers five completely online Business Administration concentrations, including Economics, Health Care Management, Human Resources Management, Management, and Marketing. In addition, the College offers a specialized program ideal for working registered nurses. The RN to BSN program ensures licensed nurses have the opportunity to advance professionally and pursue a bachelor's degree while keeping up with work and family obligations. At DeSales University -- a private, four-year Catholic university administered by the Oblates of St. Francis de Sales -- students receive an academically-fulfilling, personalized education with an emphasis on career preparedness and graduate school preparation. For students of faith, DeSales encourages participation in the Salesian Center, which promotes integration of faith and culture, rooted in the dissemination of Salesian spirituality. On-campus DeSales students can choose from more than 30 majors, have the option to design a unique program of study, and can pursue several minors and concentration areas. For remote students, the University is one of the best online colleges in Pennsylvania, and provides online learning through its ACCESS platform, which offers students beginning the application process access to an academic advisor. When applying, students can select between 13 online bachelor's degree programs, from business administration and finance to supply chain management. Once matriculated, students enroll in classes through WebAdvisor -- a secure web interface -- and may view and update personal information, grades, transcripts, class schedules, and financial aid. For students that are serious about finding a meaningful profession without sacrificing academic engagement, PhilaU is a top choice for classes with a time tested learning approach employing the Nexus Learning method, meaning that courses are active, collaborative, real world relevant, and infused with the liberal arts. Proving the success of the Nexus Learning approach, 95% of PhilaU graduates are employed or enrolled in graduate programs, including placements at some of the world's most prestigious companies and postsecondary institutions. Located only minutes from Center City Philadelphia, students at Philadelphia University get the best of everything -- a world class education, a vibrant campus life, and access to a bustling city. PhilaU is also among the best online colleges in Pennsylvania. For distance learners, the College offers nine BS degree programs completely online with BlackBoard, including accounting, behavioral and health services, business management, law enforcement leadership, among others. Getting a bachelor's degree does not need to mean putting religious faith to the side. At Eastern University -- a co-educational, Christian institution affiliated with the American Baptist Churches USA -- academics and Christianity go hand in hand. Located near Philadelphia, Pennsylvania, 3,616 degree-seeking students study at Eastern University, where nearly 150 full-time University and Seminary faculty deliver engaging, challenging academic courses both online and on-campus. Although there are numerous Pennsylvania online colleges, Eastern provides a unique mix of programs suited to distance learning, including the BA in youth ministry leadership, the BS in nursing for registered nurses (RN to BSN), the BA in organizational leadership, and the BA in business administration. Eastern University also offers several graduate degree programs, a master of divinity (MDiv) program, and two MA programs in Rwanda, Africa. Point Park is located in Pittsburgh’s vibrant downtown, and offers more than 100 undergraduate, master's, and doctoral programs to more than 4,000 enrolled students. The university focuses on promoting achievement and ensuring innovation in a diverse academic environment, and to that end, the Academic Village at Point Park University -- a multi-block residential and learning hub -- facilitates an inclusive student experience, integrating the campus with Pittsburgh at large. Point Park offers bachelor's, master's, and certificate programs online, all of which focus on applicable knowledge. Online programs are ideal for students seeking career advancement, and are highly regarded among Pennsylvania online colleges. Distance learning programs are designed with professionals in mind, ensuring that programs are flexible, and courses are delivered by leading professionals in their respective fields. The university offers online BA degrees (in mass communication, organizational leadership, and public relations and advertising), and BS degrees (in accounting, business management, criminal justice, information technology, and public administration). Located on the outskirts of Pittsburgh, Pennsylvania, Robert Morris offers countless opportunities for experiential learning and professionally-relevant internships, but with an affordable price tag. Because the university is committed to student engagement, there are over 49 undergraduate and 35 graduate programs, and students are provided with a Student Engagement Transcript (SET) to document learning that happens outside of the classroom, a feature unique to the school. RMU consistently ranks as one of the top Pennsylvania online colleges and provides distance learning through RMU Online, where academic programs are designed and taught by esteemed on-campus faculty members. To facilitate online learning, RMU online offers access to the Online Student Services Team -- which assists students with registering and identifying resources -- and the Instructional Design Team -- which assists faculty in course design and management. As a result, RMU offers numerous online degree programs, including several undergraduate degree options, such as business administration (BSBA), cyber forensics and information security (BS), health services administration (BS), and more. Situated in the hills of western Pennsylvania, Clarion University provides 5,500 students with access to more than 100 internationally accredited academic programs, essential student services, 130 student organizations, and extracurricular opportunities, including internships and study abroad programs. Whether studying on-campus or online, Clarion University of Pennsylvania is all about offering academically-enriching choices, meaning that distance learners looking for access to one of the best online colleges in Pennsylvania do not need to settle when it comes to meeting academic goals and setting a career path. The university offers 11 bachelor's degree programs completely online, across several disciplines. Degrees offered include BA, BS, BAS, and, BSBA degrees. To ensure online education is affordable, the university also provides access to an online scholarship database, where nontraditional students can find scholarships specifically for online learners, as well as scholarships for other specific needs or circumstances. Founded in 1869 and located in Pittsburgh, Pennsylvania, Chatham offers several programs online through its College for Continuing and Professional Studies (CCPS), including online degrees for distance learners, as well as certificate and non-credit academic programs. Programs include both low-residency and distance learning options in a range of subjects, including nursing, health sciences, business & communication, creative & design arts, and education. To ensure distance learning students receive the best possible education, Chatham employs the Moodle learning management system, helping students and faculty to share resources, exchange ideas, and inspire each other through collaborative learning. In addition, Panopto allows instructors and students to screen capture presentations, making an internet connection the only essential element to receiving an education from one of the best online colleges in Pennsylvania. The California U is a highly-ranked educational institution with a commitment to liberal arts, science and technology, and professional studies. The university currently serves over 7,500 students from its pastoral 294-acre campus in Southwestern Pennsylvania. For students that choose not to attend on-campus classes, the university provides access to 10 bachelor's degree programs online, including unique programs such as Arabic language and culture (BA), land management (BA, jurisprudence), and wellness and fitness (BS). Online classes are delivered via an easy-to-use platform that helps students interact with professors and colleagues, access presentations, and share ideas about course content. For active duty service members and veterans of the military, Cal U provides novel educational opportunities through Cal U Global Online. Eligible students may receive reduced tuition, access to a network of 53,000 alumni for networking, and the opportunity to receive robust career support services -- a standout among Pennsylvania online colleges. Our affordability methodology considers value-driven metrics and ranks schools that have low tuition rates, as well as proven graduation rates and employment outcomes that provide a high ROI for students. For students in Pennsylvania, there are plenty of opportunities to find an affordable program locally. While distance education provides more flexibility than an exclusively residential curriculum, there are still plenty of advantages to attending a local online college, including access to lower tuition prices and local scholarships. If you're considering going back to school, and are thinking about studying online, the following list of cheap accredited online colleges in Pennsylvania will help you start your search. Villanova University offers a number of degrees that students can earn entirely online. These include undergraduate and graduate degrees, as well as professional certificate programs. Distance learners at Villanova can earn degrees in engineering, liberal arts and sciences, nursing, professional studies, business, and law. Classes are taught synchronously and online students can attend any of their courses on-campus. Alternatively, students may access archived recordings of lectures at any time. Transfer students may enroll in a degree completion program in one of the three following subjects: leadership studies, general studies, or public service and administration. Applicants to these transfer programs must be at least 22 years old and must have completed a minimum of 15 credits at a regionally accredited institution. Chatham University in Pittsburgh offers online degrees, certificates, and non-credit programs for undergraduates and graduate students. Distance learners may pursue studies in business and communication, health sciences, and creative and design arts. Students can access course material and discussion forums asynchronously at their convenience. Though most online programs do not mandate that students be present on-campus at any time, a select few include short residency requirements. Distance learners at Chatham are charged per credit, as opposed to per term. Financial aid packages are available, including the Yellow Ribbon program for post-9/11 veterans and discounted tuition for full-time employees and members of participating companies and organizations. Located in Philadelphia, Temple University caters to students looking for flexibility in their online studies. Classes are available synchronously, asynchronously, and in a hybrid format for students in undergraduate, graduate, certificate, and non-credit programs. Undergraduates can enroll in the Accelerated 4+1 program, which allows them to use 12 elective credits to complete a portion of their master's degree at undergraduate tuition rates. The remainder of courses required for their graduate degree are completed the year after they finish their undergraduate credits. Online students pay tuition per credit hour. Located in Philadelphia, Saint Joseph's University is one of the top affordable online colleges in Pennsylvania. SJU offers master's degrees and certificates in business, education, health administration, and criminal justice. Adult learners may complete an online bachelor’s degree in business or general studies. Some online courses at SJU require a weekly session scheduled with the instructor. Students in the online bachelor's completion program may transfer a maximum of 75 credits from another school. Students who are active duty US military and their spouses are eligible for discounted tuition. Duquesne University in Pittsburgh offers fully online programs in nursing, liberal arts, business, and education. Hybrid online and on-campus programs are available for graduate students in education and music. Undergraduate students can major in nursing, organizational leadership, and computer systems. Courses vary by specific program, and may be available synchronously or asynchronously. Some instructors require that students be online at select times to view or participate in webinar sessions. Sessions are later archived for student reference. Duquesne offers several discount tuition programs, including those for post-9/11 veterans and employees of select organizations in Pennsylvania. Drexel University in Philadelphia offers more than 140 online degree and certificate programs. Available fields of study include arts, business, construction, criminal justice, education, computer science, engineering, general studies, hospitality, legal studies, healthcare, and psychology. Classes may be taught synchronously or asynchronously, depending on the program. Admission requirements vary between programs. Transfer students must have completed at least 24 credits at a prior institution, with an average grade of "C" or higher. Drexel offers reduced tuition to employees of partner companies and organizations, members of the military, and Drexel alumni. Online students at Rosemont College can earn their master's degree in business administration, healthcare administration, or strategic leadership. Rosemont also offers an online bachelor’s degree in criminal justice. Graduate certificates are available in healthcare administration, leadership studies, entrepreneurship, or forensic psychology. These degrees are fully online and do not require students to travel to campus. Applicants to the graduate degree and certificate programs must have a minimum GPA of 3.0. Students applying for an online master's degree should also have a bachelor's degree from an accredited four year college or university. Additionally, applicants to graduate business programs must have completed a college level composition course and a college level math course. Students may transfer a maximum of six credits from an accredited institution. Financial aid packages are available. Located in Lancaster, Pennsylvania College of Health Sciences offers online bachelor's degrees in health sciences and nursing and online master's degrees in public health, health sciences in education, and health care administration. Online students are invited to take advantage of student services such as tutoring and advising on time management. Applicants must have a high school diploma or GED, which includes prerequisite courses in English, biology, lab science, and algebra. Preferred applicants must have a 3.0 GPA or better. Applicants must also have satisfactory SAT or ACT scores, preferably a combined reading and math score of 1000 or greater. Elizabethtown College provides several online programs through its School of Continuing and Professional Studies. The school offers accelerated undergraduate programs in business administration, criminal justice, healthcare administration, and human services. Several online graduate programs are also taught in an accelerated format, and include the master's of business administration, graduate certificate in healthcare administration, and graduate certificate in strategic leadership. The school also offers several hybrid programs for students who are able to take some classes on-campus. Applicants must have at least three years of full-time work experience, be at least 23 years old, hold a high school diploma or GED, and pass a pre-admission writing exam. Tuition is charged per credit hour. Financial aid is available to online students. Cedar Crest College in Allentown offers seven fully online degrees through the School of Adult and Graduate Education. Undergraduate students may receive a bachelor’s in nursing or business. Business students can choose one of five concentrations: economics, healthcare management, human resources management, management, and marketing. For graduate students, Cedar Crest offers an online master's in education in the art of teaching. Online courses are available in either a regular or accelerated format. Undergraduate students are required to complete at least 30 credits at Cedar Crest College. Students may transfer up to 68 credits from a community college and up to 90 credits from a four year college or university. Working students may also earn college credit for eligible on-the-job learning. Online students at La Salle University can earn their bachelor's or master's degree in nursing or business. Course format varies by program; some classes are available asynchronously, while others require synchronous video and webinar participation. Admission requirements depend on the specific program as well, with minimum GPA ranging from 2.0 to 3.0. Some programs include an industry experience requirement, including a nursing license for the BSN program. La Salle allows undergraduate students to transfer 30 credits, while graduate students can transfer a maximum of six credits. Slippery Rock University offers online undergraduate, graduate, doctoral, and certificate programs. The undergraduate programs are degree completion programs; students must have completed their general education and prerequisite courses before enrollment. SRU currently offers five bachelor’s degrees in leadership studies, management, nursing, nonprofit management, and interdisciplinary studies. Most course material is accessible asynchronously, while some courses include synchronous elements. Online students aren't permitted to live on SRU's campus, but may take one on-campus class per term, totaling no more than five on-campus classes per degree. Applicants must have earned an associate degree at an accredited institution recognized by SRU, with a GPA of 2.0 or above. Applicants to the BSN program must have an RN license and a minimum GPA of 2.5 in their prior nursing program. SRU has one of the lowest tuition rates in the state, making it one of the most affordable online colleges in Pennsylvania. Carlow University, located in Pittsburgh, is among the top colleges in Pennsylvania. Carlow offers online bachelor's programs in business management, health management, and nursing; master's programs in education, business, nursing, and forensics; and certificates in autism spectrum disorders and instructional design. Online programs at Carlow differ in delivery method; some are synchronous while others are asynchronous. Admission requirements vary from program to program as well, but undergraduate programs take a holistic approach to student evaluation for admission and don't have a set minimum GPA. The graduate programs generally require a GPA of 3.0 and above. Online students may transfer up to 88 credits into an undergraduate program, and a maximum of six for graduate programs. DeSales University in Center Valley offers 12 accelerated online bachelor's degrees, including theology, finance, homeland security, and criminal justice. The school also offers several hybrid degrees, including family studies and pharmaceutical marketing. Classes are available synchronously, asynchronously, or in a combination of both formats. Students may transfer up to 75 undergraduate credits. DeSales allows students to earn college credit for knowledge acquired through nontraditional learning experiences, enabling online students to complete their degrees more quickly and at a lower cost. Demonstration of this acquired knowledge can be completed through one of several assessment tools. Located in Beaver Falls, Geneva College is one of the most affordable Pennsylvania universities. Geneva offers a variety of online bachelor's degrees, including child services, public relations, and criminal justice. Geneva also offers master's degrees in business administration and leadership studies. Classes are available asynchronously through the Blackboard platform. Online degree candidates are eligible for financial aid, veterans benefits, and employer benefits programs. Geneva provides several financial aid opportunities such as grants and scholarships. Applicants to undergraduate programs must have a GPA of 2.0 or higher. The online master's in business administration requires a 2.5 GPA, while the master's in leadership studies requires a 3.0 GPA. Saint Francis University in Loretto offers an array of certificates, associate, bachelor's and master's degrees that can be earned entirely online. Degree subjects include healthcare, business, education, and technology. Coursework is mainly asynchronous. Admission requirements and number of transfer credits allowed vary by online program. Saint Francis will accept many forms of experience for transfer credit, such as military service, prior learning exam results, high school classes taken for college credit, and workplace and specialized training. Online tuition is charged on a per-credit basis, and financial aid options are available, including discounted tuition for military and ROTC service members. Philadelphia University provides the opportunity for students to earn their degrees in one of nine online bachelor's programs or five online master's programs. Notable programs include sustainable design, disaster medicine, midwifery, and emerging technology. Tuition rates for online programs at PhilaU have been decreased by up to $9,000 from last year's rates, making it one of the most affordable online colleges in Pennsylvania. Admission to an undergraduate program requires a high school diploma or GED, and graduate admission to select programs requires work experience. Students can transfer credits from classes in which they earned a "C-" grade or better. La Roche College in Pittsburgh prides itself on the ease with which students may transfer credits and complete their online programs in less time and for less money. La Roche offers bachelor's degree completion programs in leadership and administrative development, medical imaging, nursing, and criminal justice, as well as online master's and doctorate degrees in nursing. Bachelor's degree completion students may transfer up to 90 credits from a combination of studies at accredited institutions and professional experience. Admission requirements vary from program to program, with minimum GPA ranging from 2.5 to 3.25. Applicants to the doctorate in nurse anesthesia practice program must provide proof of a research thesis or evidence based on research in order to be admitted. Students in this program must participate in three immersion sessions on-campus. La Roche offers financial aid packages for online students, including discounted tuition for military service members. Located in Chester, Widener University offers several degree programs that can be completed strictly online. Distance learners may choose to enroll in the registered nurse to bachelor's in nursing (RN to BSN) program, or may decide to pursue a master's degree in business administration, social work, education in educational foundations, or education in instructional technology. Most courses are presented asynchronously for student convenience, although some instructors require synchronous components such as weekly meetings. Applicants to the RN to BSN program must have an associate degree with at least a 2.0 GPA and a registered nurse license. MSW candidates must have a minimum 3.0 GPA, while MBA candidates must have a minimum 2.7 GPA and a GMAT score of at least 450. Tuition is charged per credit and varies from program to program. Financial aid comes most commonly in the form of federal loans, however some students may qualify for discounted tuition as military service members or employees of certain organizations. Pennsylvania State University, located in University Park, offers more than 125 online degrees and certificates. Certificates are available at both the undergraduate and graduate level, along with associate, bachelor's, master's and doctorate degrees. Courses are fully online and asynchronous; however, the master's programs in business administration, finance, health administration, and supply chain management include short residency requirements. There is no limit to the number of undergraduate credits students may transfer, although 18 of the last 30 credits of an associate degree and 36 of the last 60 credits for a bachelor's degree must be earned at Penn State. Graduate students may transfer up to 10 credits from an outside university. Online students may qualify for financial aid packages, including employer reimbursement, military service discounts, and tuition assistance for unemployed students. Robert Morris University in Pittsburgh offers online certificates, bachelor's degrees, and master's degrees in the fields of business, leadership, information systems and technology, healthcare, education, criminal justice, and engineering. Distance learners are assigned a dedicated online student services representative who can help them navigate the registration process and begin their programs. Online students also have the benefits of a personal wellness counselor and financial aid counselor. These specialists are meant to make distance learners feel cared for by the university, despite their physical absence. Online students at RMU may qualify for discounted tuition as military service members or employees of organizations who participate in a corporate discount program. Gwynedd Mercy University offers an online associate degree in business administration; online bachelor's degrees in business administration, nursing, and psychology; and online master's degrees in business administration, education, and nursing. Online courses include both synchronous and asynchronous elements. Applicants to the associate degree program must have proof of high school completion and a GPA of at least 2.0. Students applying to bachelor's degree completion programs must have at least 46 credits of prior college experience with a minimum 2.0 GPA. Graduate admission requirements vary across the different programs, but most require a minimum 3.0 GPA. Students may be eligible for financial aid, including scholarships specifically for transfer students. Located in Dallas, Pennsylvania, Misericordia University offers online undergraduate and graduate certificates, as well as bachelor's, master's and doctorate programs. Fields of study include business, health care, and information technology. Particularly appealing for some online students are the Expressway Accelerated degrees, which allow students to take a heavier courseload than normal and complete their bachelor's degrees in as little as two and a half years. Misericordia’s general admission requirements state that students should have a minimum high school GPA of 2.5 and a minimum SAT (math + critical reading) score of 850. Transfer credits may be accepted at different levels depending on the type of degree program. MU has transfer agreements with several community colleges in Pennsylvania. Located in California, Pennsylvania, California University of Pennsylvania offers over 40 online certificate and degree programs. Notable programs include sport psychology, international security, fitness, legal studies, cybersecurity, and Arabic. Course material is available asynchronously, and there is no on-campus residency requirement. Students are grouped into cohorts of 30 to 40 students who move through the program together. At least 30 of the last 60 credits of an undergraduate degree must be taken at Cal U. Cal U's various financial aid packages make the school one of the most affordable online colleges in Pennsylvania. Located in St. Davids, Eastern University is one of the most affordable online colleges in Pennsylvania. EU offers online students certificate, associate, bachelor's, master's, and doctorate programs. Available fields of study include education, leadership and development, business, nursing, seminary, and urban studies. All classes are asynchronous. Although most of the coursework is completely online, eight of 23 programs include a short term residency requirement. EU is one of the Christian colleges in Pennsylvania. Students may transfer up to 89 undergraduate credits or nine graduate credits. Distance learners are invited to take full advantage of many of the same resources that are available to traditional students on-campus. Each student at EU, online or on-campus, is connected to a student success advisor. Over the last decade, Pennsylvania has demonstrated remarkable leadership in the online education sphere. From the Penn State World Campus, arguably the premier, fully online degree service, to the PA Universities Online program, a complete directory of online courses at 14 renowned PA schools, the state is a pacesetter in online initiatives. Further information about support services and online expansion plans can be found at the Pennsylvania Distance Learning Association, a membership driven organization, which covers online undergraduate programs, K-12 offerings and the community of teachers and administrators bringing academic excellence to online coursework. 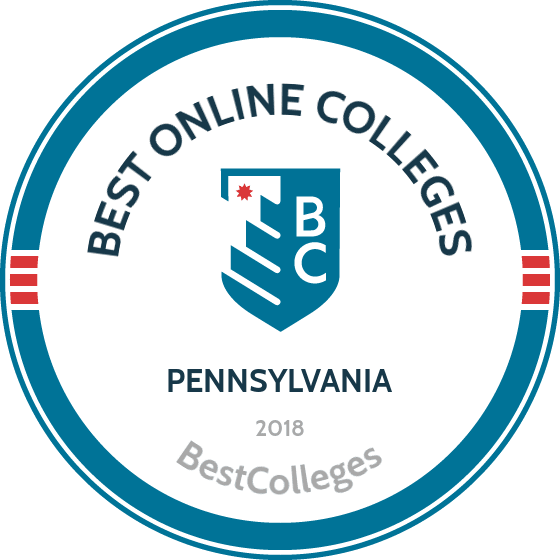 Browse our list of the best online colleges in Pennsylvania for more insight into distance learning programs in this state. More than 60,000 students enrolled in Title IV institutions in-state, roughly 8% of all such students, were taking part in fully online degree programs. Of those, more than half were residing in Pennsylvania; virtually all other students resided somewhere else within the United States. 63.5% of these 60,000 students were enrolled in fully online undergraduate programs. In Pennsylvania, employment growth in this profession is moderate. According to the Pennsylvania Center for Workforce Information & Analysis, long term projections show an increase of 3% in the total number of degree-related jobs between 2014 and 2024. Wages increased by 12% from 2011-2016. What were the top careers in Pennsylvania in 2016 for people who had a degree in business administration and management? Data source: Pennsylvania Center for Workforce Information & Analysis, Bureau of Labor Statistics. Data may not be available for every year. Employment growth in this profession in Pennsylvania is poor. According to the Pennsylvania Center for Workforce Information & Analysis, long term projections show a decrease of 14% in the total number of degree-related jobs between 2014 and 2024. Wages decreased 13% from 2011-2016. In Pennsylvania, what were the top careers in 2016 for people who had a degree in liberal arts and sciences/liberal studies? Employment growth in this profession in Pennsylvania is strong. According to the Pennsylvania Center for Workforce Information & Analysis, long term projections show an increase of 15% in the total number of degree-related jobs between 2014 and 2024. Wages increased by 4% from 2011-2016. In Pennsylvania, what were the top careers in 2016 for people who had a degree in registered nursing? Employment growth in this profession in Pennsylvania is strong. According to the Pennsylvania Center for Workforce Information & Analysis, long term projections show an increase of 181% in the total number of jobs relevant to this field between 2014 and 2024. Wages among degree-related careers increased by 13% from 2011-2016. In Pennsylvania, what were the top careers in 2016 for people who had a degree in psychology? Employment growth in this profession in Pennsylvania is strong. According to the Pennsylvania Center for Workforce Information & Analysis, long term projections show an increase of 21% in the total number of relevant jobs between 2014 and 2024. Wages among degree-related careers increased by 15% from 2011-2016. In Pennsylvania, what were the top careers in 2016 for people who had a degree in information science?